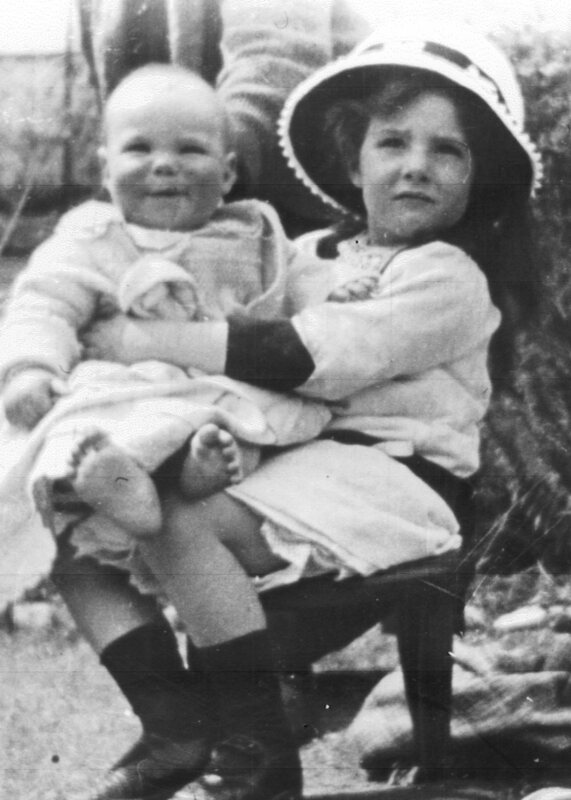 Phyllis was born in Killiney in 1910. Her father Ernest Robinson was the youngest son of a Dublin coal merchant. Ernest and his two brothers all went separately to South Africa after their father’s firm went bankrupt in the 1890s, and Ernest was the only one to return home. He was a soldier in the Boer War and became a Captain in the First World War. After leaving the army he studied law and became a barrister in his forties, with middling success. Phyllis, his eldest child, spent much of her early childhood with her mother’s family, the Waterhouses. Her mother, known as Dolly to all her family, was noted for her unflappable tact and good sense. Dolly’s mother-in-law had let her know that Ernest was to be spoiled thoroughly, and she duly did that. From the earliest age Phyllis was mad about horses. About the age of nine or ten she got in the habit of leaving the house early in the morning by climbing down a tree from an upstairs window, and helping the local milkman make his rounds. While he put the milk on his float, she would ride the horse around his field. He allowed her to drive the milk float on its round, and she would always remember with horror one occasion when the horse got going too fast and couldn’t slow down on the steep Killiney hill; it was galloping out of control, but either by luck or skill, or both, no harm was done. When the round was over, Phyllis would return home and look out for a sign from her sister, a towel in the window, to show that her father had left the bathroom and she could climb back up the tree and in through the window. One day one of her Waterhouse uncles met the young Phyllis on the road with a herd of cows. She was entrusted with the herd by a local farmer, to bring them from one field to another. Rather than drive the cows, the method was to take the bull by the ring in its nose, holding it with a hook on the end of a pole, lead it along, and all the cows would follow. Her uncle was horrified and ordered her to let go of that dangerous beast at once. The ten-year-old refused to do such a ridiculous thing, and her uncle stormed off to report her to her parents, who saw her point of view and stood up for her. Phyllis was sent to the French School in Bray, where (she would say) she got the worst education imaginable. She always loved reading but regretted that her expensive education had given her no taste in literature. Her parents were worse off than their owning-class upbringing, but even when money was tight, the family always kept a living-in servant. Phyllis and the other children were forbidden to play either with their Catholic neighbours or with Protestant ones of the wrong class. In the 1920s the family did become friendly with one local Catholic family, the Burkes, through their sons’ meeting in the Boy Scouts. One of the Burkes, who became a nun, remained a lifelong friend and constant correspondent of Phyllis and her sister Audrey. At the age of eighteen or so Phyllis answered an ad in a newspaper and took a poultry apprenticeship with a Mrs Hamilton in Killeshandra. She loved the work and got on well with everyone there. She would answer back firmly when accused of not having done some task, “That is because you told me to stop and do something else”, which Mrs Hamilton would have to confess was true. The Hamiltons’ son Guy was expected to be called ‘Master Guy’ by the apprentices, but Phyllis reasoned that in that case he should call her ‘Miss Robinson’, as she was an apprentice and not a servant, so he relented and they proceeded on first-name terms. One one occasion at the Hamiltons’ an older man, perhaps the father, asked Phyllis “Are you a Catholic?” to which she replied, remembering her Nicene Creed, “Yes, but not a Roman Catholic”. Again, her logic was recognised. While in Cavan she became friendly with Jack Faris from Cornafean. He had been to Portora School with Sam Beckett (though he didn’t remember much about him, since Beckett was three years his junior). After her apprenticeship was complete Phyllis returned to Dublin; by this time the family had moved from Killiney to Monkstown. She kept poultry at home for several years, selling eggs locally, despite her father immediately taking down the ‘Eggs for sale’ sign she put on the gate; it wouldn’t do to have such a thing seen at the home of a barrister. Phyllis became engaged to Jack and in June 1935 they were married in Monkstown Parish Church; Phyllis was twenty-four, Jack in his early thirties. They lived first in Dundalk, where Jack had a job; later he became an inspector of butchers’ shops, enforcing the wartime limits on meat production. A butcher would claim he had only one carcass on the premises, and Jack would sometimes quietly remark that it was a queer beast that had two left sides. When Jack inherited Corr farm at Cornafean they moved there, and their son Ronald was born in 1941. Sadly the child died after a week, and they never had another. Phyllis went on receiving advertisements from various firms: “Now your child is two, you will need this”. Her instinct for conservation saw her keep even these painful letters to the end of her life. Jack’s mother was feared by all the Faris family, but Phyllis got on well with her. Phyllis had the leg of her from the start, as she put it. Rather than ask her mother-in-law’s advice she would say, for instance, “We have decided to decorate this room with green dots and pink stripes.” The mother-in-law was free to give her opinion, which Phyllis could consider and reply, “We think green and pink would be good”. She knew that if advice is asked and then not followed it can breed resentment. Shortly after moving in to Corr House Phyllis was visited by a woman who invited her to join a women’s Orange society. Phyllis felt outraged; she sent her away with a flea in her ear without ever finding out who she was. Like all her family, even her British Army father, she welcomed the new Irish State, and in turn the Republic; she put her energy into developing it, by helping to empower Irish women. She was deeply involved in the Irish Countrywomen’s Association, particularly organising debates, readings and impromptu speaking competitions, to encourage women to speak fearlessly in public. She was remembered for this by women who had been at first barely able so much as to stand up and say their name. She could be spectacularly infuriated, for instance by a letter she received in her nineties asking her to contribute material for a book about ‘the West Brit’. That is a category she never subscribed to. Phyllis died in Corr House at the age of ninety-six, still living alone, the last of her siblings. She asked me to tell her the names of all my brothers’ families, and by the time I finished she had slipped into a coma from which she didn’t awake. I’ve been learning a French song on ukulele—La Mer by Charles Trénet. Infinitely more poetic than its English translation Somewhere Over the Sea which I remember from childhood. The other day I looked at a few YouTube clips of Trénet singing it in his gentle bass voice, so mellifluous and evocative. In this version something about him reminded me of my Uncle Tom, who died when I was about twenty. He didn’t look particularly like him, though they both had broad faces and thrilling voices; Tom’s hair was dark but had the same kind of wave in it as Trénet’s. All the same I think the thing that reminded me most of Uncle Tom was the eager light that played over his features, particularly his eyes. Uncle Tom was a clergyman with a wicked sense of humour. He had a talent for making ghost stories incredibly scary. I remember listening transfixed in the cottage at Brittas Bay with four or five others as he told us about Peggy’s Leg and The Man With No Face. Peter asked him to stop, and he did, probably on account of me. I was the youngest there, maybe eight or nine at the time. But my memory of the creepy feeling is not in the least unpleasant, and never was. Later I went with some of the same group of cousins to horror films in Skerries, the ticket sellers turning blind eyes to my obvious underage. Peter Cushing and Christopher Lee in The Curse of Frankenstein and The Horror of Dracula. Not a patch on Uncle Tom. Every summer until I was eleven we spent two months in Green Cottage, Brittas Bay. Peter made friends there with David Rowell, who was the exact same age, and we celebrated their common birthday every August. Villain: At last Lady Rosalind we meet face to face. Last time I was here you scorned me, upbraided me, and spurned me from your door. But now the tables are turned and you are in my power! Lady R: But you cannot take the roof from off my child’s head! Villain: I care nothing for you or your brat! Begone! Lady R: But my husband is the rightful owner and may still be living! Villain: Your husband is dead—I have here the proof! The hero is supposed to come on at that point and say ‘Your deeds are false, for I am here’, and the comedy arises from his failure to do so, whereupon the whole thing is repeated, at increasing tempo, until finally he enters confidently with ‘Your teeth are false for I am here’. The show ran for four days, December 15th to 18th. The previous year Michael Milne, brother of David, had sung bass, as he did on our two records for EMI Ireland (IEMC 6005 & 6008). In 1975 Michael, Barra and Mark Molony and I danced a hearty buffens from Arbeau’s book, hacking mercilessly at one another’s wooden swords. We all danced, except for David Milne who kept the music going on the harpsichord for the big numbers. We invited the audience to partner us in the simple ones, pavans and branles, and to our amazement they volunteered in droves. We did a long farandole, down the hall and out the door, snaking across the cobblestones of Front Square; no such thing then as public liability insurance, but nobody (as it happened) broke an ankle. The following year Barra left to do his doctorate in Holland (he became the world authority on the crumhorn) and I went to learn instrument making in Sussex. The group went into abeyance; after that we had sporadic reunions. 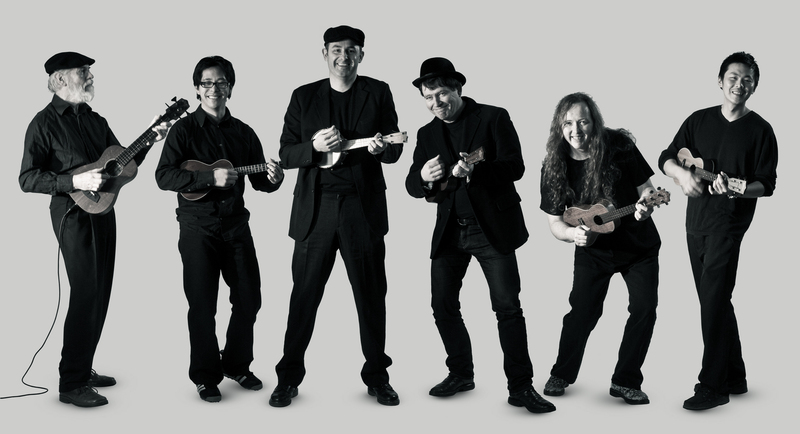 My ukulele band Ukeristic Congress has had two public outings: Friday the 12th in Annesley House, North Strand Road, and again last night in McSorley’s of Ranelagh, as part of the benefit gig for Haiti. I invited Terry Connaughton, chariman of the Ranelagh Arts Festival, to come along to hear us at the January meeting in Shebeen Chic, George’s Street, and he agreed to put a uke concert into this September’s festival. He also asked us to join the lineup for Haiti. He put us on third last, followed by Bree Harris with a terrific rock band, and Donal Lunny (back in Ireland) with the fiddlers Ciaran Tourish and Dermot McLoughlin. I caught up with Eamon Carr, who read a poem for Haiti with recorded music and live drummer (Daniel Figgis). I hadn’t spoken with him since Tara Telephone days, forty years back. He said that Lorelei Templeton, the woman who put together the Tara Telephone page, is a uke fanatic in San Francisco. Influenced by her, Eamon had bought a uke, but couldn’t hack it as he lost the tip of his little finger in an accident. Ukeristic Congress (Shay Bagnall came up with the name) is entirely managed by group emails. It’s a great bunch of people, currently nine of us. We rehearse on Saturday afternoons in McCloskey’s pub. If there is a rugby match on TV it becomes too noisy for us, so we are trying out the Charleville Tennis Club in Phibsborough next Saturday. I sang in the Bach concert St Ann’s, Dawson Street, yesterday as a member of The Cantata Singers. Four cantatas, numbers 62, 61, 60 and 36. This year sees the end of the Orchestra of St Cecilia ten-year project; by the last concert on the 7th of March, all 200 extant church cantatas by J S Bach will have been performed. Bravissimo! What next? Well, there are the secular cantatas, which strangely include (according to Lindsay, the St Cecilia manager) the Actus Tragicus: the funeral cantata with two recorders and two viols. Ausgezeichnet!—or as they say in the States, Outa sight. Dublin’s Cantata Singers were founded by John Beckett in the seventies, when he began the tradition of doing cantatas in St Ann’s on Sunday afternoons in February. He played the piano himself for our rehearsals, brilliantly. Such a stickler for time: his rehearsals were set for 8pm but everyone knew well enough to come early—they always actually began at five to eight. In those days if you got a phone call at 7.30 in the morning, you knew it was John Beckett. 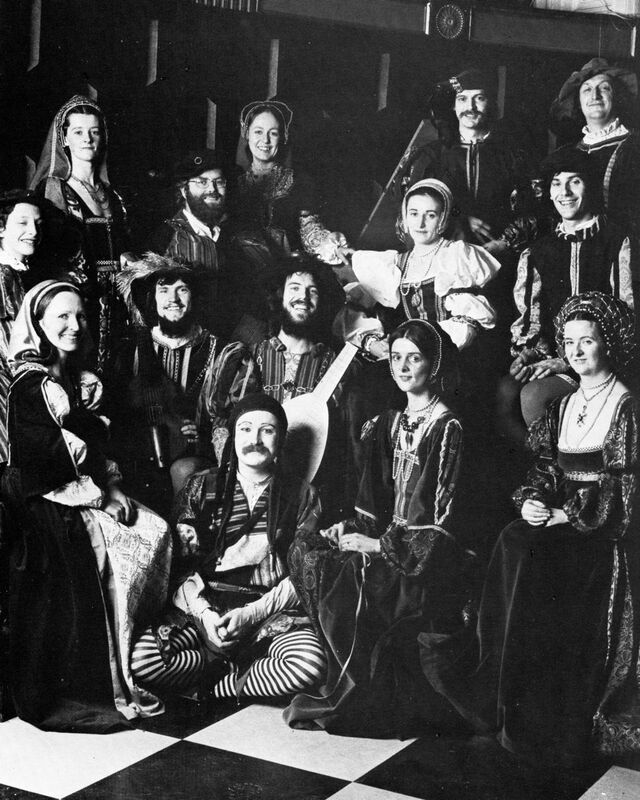 Our high point came in 1979 when the Cantata Singers were invited to do an all-Bach programme for the London Proms, conducted by John and with the previous incarnation of the Orchestra of St Cecilia, confusingly then called The New Irish Chamber Orchestra. I remember clearly travelling by tube to the concert, and having to restrain myself from telling everyone on the train ‘I’m going to sing in the Albert Hall’. The following year we did a similar concert in the Flanders Festival, in Bruges. When John died three years ago, Rhoda Draper put together a memorial concert for him in St Ann’s. She contacted all the old Cantata Singers and a mighty proportion of us got back together for the concert, under David Milne. Since then we have regrouped twice, for Lindsay’s cantata series last year and yesterday. We haven’t lost our verve. In 1973, just after he started putting on the cantatas, John also began the Academy viol consort class, which I attended and eventually inherited when he left for London in 1983. Honor took it for the five years I was in Clare in the nineties, and just last September it left the Academy: it continues on Wednesdays in my house. As a viol player, its most distinguished ex-member must be Ibi Aziz, who fell in love with the viol and gave up medical studies in TCD to become a career violist. Four of us are off to a course taught by him in Wales next April. 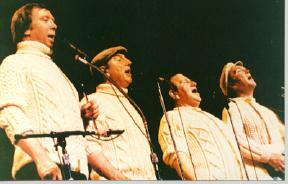 Liam Clancy has died, the last of The Clancy Brothers and Tommy Makem. In his honour I sang two Clancy Brothers songs last Saturday, at the Ukuhooley get-together in Doheny & Nesbitt’s—Brennan on the Moor and The Bold Tenant Farmer. These came off the first Clancy Brothers album which we more or less wore out in Kerry in the summer of 1962; I played guitar and Nick and I sang, and I think we memorised the lot. No trouble remembering them last Saturday, even though I only decided on the spot that that’s what I would sing. At the session I met Lucy Johnston of The Johnstons. To my embarrassment, though I knew the name I had never heard her family group which flourished in the sixties and included the young Paul Brady, but she had been at our St Sepulchres concerts. On Saturday we added harmonies to other people’s songs. A nice noisy night.